26 m a s s a g e & b o d y w o r k s e p t e m b e r / o c t o b e r 2 0 1 8 BLUEPRINT FOR SUCCESS best practices Strategies for Getting a Grip Is Your Business a Hot Mess or Are You on Solid Ground? 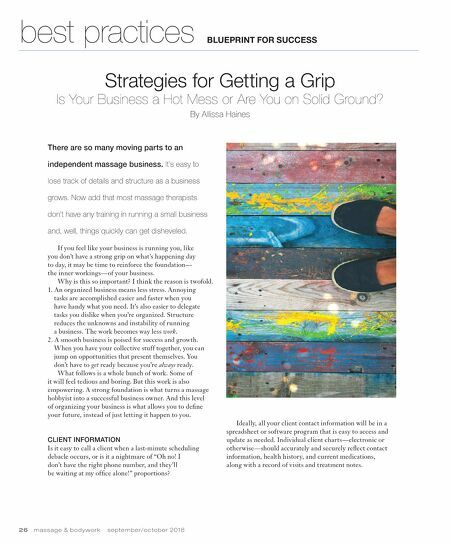 By Allissa Haines There are so many moving parts to an independent massage business. It's easy to lose track of details and structure as a business grows. Now add that most massage therapists don't have any training in running a small business and, well, things quickly can get disheveled. 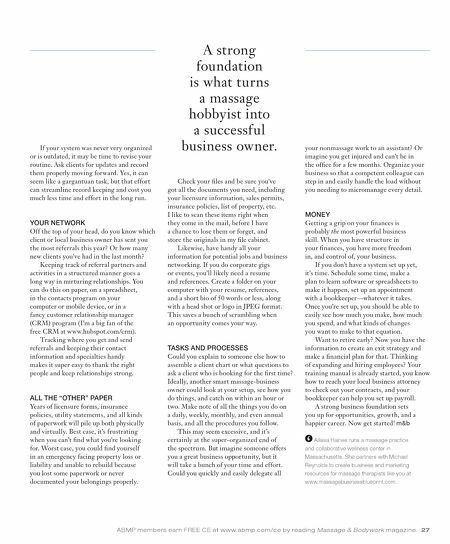 If you feel like your business is running you, like you don't have a strong grip on what's happening day to day, it may be time to reinforce the foundation— the inner workings—of your business. Why is this so important? I think the reason is twofold. 1. An organized business means less stress. Annoying tasks are accomplished easier and faster when you have handy what you need. It's also easier to delegate tasks you dislike when you're organized. Structure reduces the unknowns and instability of running a business. The work becomes way less work. 2. A smooth business is poised for success and growth. When you have your collective stuff together, you can jump on opportunities that present themselves. You don't have to get ready because you're always ready. What follows is a whole bunch of work. Some of it will feel tedious and boring. But this work is also empowering. A strong foundation is what turns a massage hobbyist into a successful business owner. And this level of organizing your business is what allows you to define your future, instead of just letting it happen to you. CLIENT INFORMATION Is it easy to call a client when a last-minute scheduling debacle occurs, or is it a nightmare of "Oh no! I don't have the right phone number, and they'll be waiting at my office alone!" proportions? Ideally, all your client contact information will be in a spreadsheet or software program that is easy to access and update as needed. Individual client charts—electronic or otherwise—should accurately and securely reflect contact information, health history, and current medications, along with a record of visits and treatment notes.